The Siege of Cambrai took place from 20 March to 19 April 1677 during the 1672-1678 Franco-Dutch War; then part of the Spanish Netherlands, it was invested by a French army under the duc de Luxembourg. Siege operations were supervised by the military engineer Vauban; Louis XIV was present and nominally in command but he played little part in operations. An attempt by a combined Dutch-Spanish force under William of Orange to relieve the nearby town of Saint-Omer was defeated by Luxembourg at Cassel on 11 April. Cambrai surrendered on 19 April and was ceded to France by Spain in the September 1678 Treaty of Nijmegen. In the 1667-1668 War of Devolution, France captured most of the Spanish Netherlands and the Spanish province of Franche-Comté but many of their gains were relinquished by the Treaty of Aix-la-Chapelle, agreed with the Triple Alliance of the Dutch Republic, England and Sweden. To split the Alliance, Louis XIV paid Sweden to remain neutral, while signing an alliance with England against the Dutch in the 1670 Treaty of Dover. France invaded the Dutch Republic in May 1672 at the start of the Franco-Dutch War and initially seemed to have won an overwhelming victory. However, the Dutch position stabilised, while concern at French gains brought support from Frederick William of Brandenburg-Prussia, Emperor Leopold and Charles II of Spain. France retained the Dutch stronghold of Maastricht, but withdrew from the Netherlands in 1673, additional fronts opening in the Rhineland and the Spanish Pyrenees. The French position weakened in early 1674, when Denmark-Norway joined the Alliance in January, followed by the February Treaty of Westminster making peace between England and the Dutch Republic. An effective Allied response in Flanders was hampered by power struggles in Madrid, while Spanish control over the Spanish Netherlands was by now largely nominal. Peace talks had begun at Nijmegen in 1676 but Louis' policy was to take the offensive before agreeing terms and negotiate from strength; the French quickly captured Condé-sur-l'Escaut, Bouchain, Maubeuge and Bavay. The capture of Condé and Bouchain allowed them to blockade Valenciennes and Cambrai; their cavalry fought skirmishes with the Spanish garrisons and devastated the villages around the towns. Marshall Schomberg, commander of the French field army in Flanders, proposed taking Cambrai in August but was ordered to relieve Maastricht, then under siege by the Dutch. The plan for 1677 was to take Valenciennes, Cambrai and Saint-Omer, completing the French frontière de fer or 'iron border;' Louis calculated this would leave the Dutch little reason to continue. In the winter of 1676/1677, the French assembled supply depots along the border with the Spanish Netherlands, which allowed the campaign to open in February, a month earlier than usual. In late February, a detachment of 12,000 men besieged Saint Omer, while the main army of 35,000 men under Luxembourg surrounded Valenciennes; after it surrendered on 17 March, they moved onto Cambrai. During the winter of 1676/1677, the French prevented the garrison being resupplied; on 4 December 1676, Louis signed an order forbidding the sale of grain or forage to Cambrai, with large fines for any village found to have done so. The Comte de Montal, French governor of Charleroi, was ordered to seize any grain being transported from Namur and prevent the movement of personnel. Spanish officers had to disguise themselves as peasants to evade the blockade and one French commander was reprimanded for allowing a Spanish official to slip into Cambrai in late January. After Valenciennes capitulated, Luxembourg and his army moved onto Cambrai. On 22 March, 7,000 locally conscripted peasants began digging lines of circumvallation and contravallation and on 30 March, French siege artillery commenced bombardment of the walls. By 3 April, the breach was large enough for their troops to assault and capture the Selles and Notre Dame gates; the city surrendered on 5 April, although the Citadel still held out. Meanwhile, William of Orange assembled a combined Dutch-Spanish army of 30,000 men; he could not save Cambrai but was determined to fight for Saint Omer. The Allied army reached Mont-Cassel on 9 April, about 15 kilometres west of Saint-Omer; leaving minimal forces to maintain the sieges, a combined French army under Luxembourg defeated the Allies at Cassel on 11 April. Vauban now focused on taking the Citadel but against his advice, an attempt was made to storm the outworks on 10 April, resulting in nearly 500 French casualties. They included one of his own nephews; using Vauban's slower but more effective methods, the Citadel surrendered on 19 April. The garrison commander, Don Pedro de Zavala, wounded during the siege, was given a pass with 2,000 others to the nearest Spanish-held town. Three days later, Saint Omer also surrendered; French strategy was to make gains early in the campaigning season, before the Allies could mobilise and this largely completed their 1677 objectives in Flanders. The peace talks at Nijmegen were given a greater sense of urgency in November after William's marriage to his cousin Mary, niece of Charles II of England. An Anglo-Dutch defensive alliance followed in March 1678, although English troops did not arrive in significant numbers until late May; Louis used this opportunity to capture Ypres and Ghent in early March, before signing a peace treaty with the Dutch on 10 August. The war with the Dutch officially ended on 10 August 1678 with the signing of the Treaties of Nijmegen, although a combined Dutch-Spanish army attacked the French at Saint-Denis on 13th. This ensured Spain retained Mons and on 19 September, they signed their own treaty with France, ceding Saint-Omer, Cassel, Aire, Ypres, Cambrai, Valenciennes and Maubeuge. 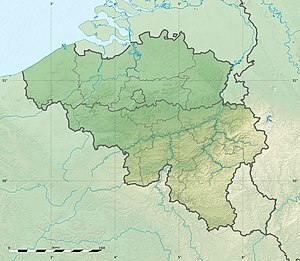 With the exception of Ypres, returned to Spain in 1697, this fixed France's northern frontier close to where it remains today but Nijmegen proved the highpoint of French expansion under Louis XIV. ^ Lynn, John (1996). The Wars of Louis XIV, 1667-1714 (Modern Wars In Perspective). Longman. p. 109. ISBN 978-0582056299. ^ Smith, Rhea (1965). Spain; A Modern History. University of Michigan Press. p. 200. ISBN 978-0472071500. ^ Davenport, Frances (1917). "European Treaties bearing on the History of the United States and its Dependencies". p. 238. Retrieved 7 October 2018. ^ Van Nimwegen, Olaf (2010). The Dutch Army and the Military Revolutions, 1588-1688 (Warfare in History). Boydell Press. p. 499. ISBN 978-1843835752. ^ Satterfield, George (2003). Princes, Posts and Partisans: The Army of Louis XIV and Partisan Warfare in the Netherlands (1673-1678). Brill. pp. 298–299. ISBN 978-9004131767. ^ De Périni, Hardÿ (1896). Batailles françaises. Ernest Flammarion, Paris. p. 190. ^ "Siege of Cambrai 1677". Fortified Places. Retrieved 15 January 2019. ^ De Larrey, M (1721). Histoire de France sous le règne de Louis XIV, Volume 4. Michel Bohm, Rotterdam. pp. 371–372. ^ Lesaffer, Randall. "The Wars of Louis XIV in Treaties (Part V): The Peace of Nijmegen (1678–1679)". Oxford Public International Law. Retrieved 30 December 2018. ^ Nolan, Cathal J (2008). Wars of the age of Louis XIV, 1650–1715. ABC-CLIO. p. 128. ISBN 0-313-33046-8. Van Nimwegen, Olaf (2010). The Dutch Army and the Military Revolutions, 1588-1688 (Warfare in History). Boydell Press. p. 499. ISBN 978-1843835752. Françoise Magny, Cambrai ville fortifiée, Cambrai, Maison Falleur, 1991. On trouve dans cet ouvrage le plan d'attaque français. This page was last edited on 27 January 2019, at 15:50 (UTC).